Totally not bjd related but even though they are never talked about I do love my girls (Blythes, Pullip and Una are “the girls”, Bjd are what I call “the boys”, as if you didn’t know already). Even though I was skeptical at first I actually do like the new Middi Blythe. She’s cute. I’m not sure how long it will take me to cave and get one of these girls. I’m going to wait and see what other ones they come out with first. I would love to have a brunette. 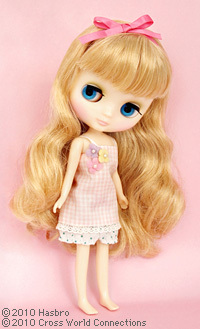 There isn’t a whole lot of info out on her but here is a link to the Blythe blog. Artist have already started making customs versions of these girls. One that I spotted recently was this lovely girl by Daisy-D. That dress and smock are so amazing. Incredible detailing.